Pharmaceutical companies are now employing advanced medical breakthroughs and new technologies, including gene therapies and nanoparticle engineering, to fight every type of cancer. Gene therapies are being developed to more effectively target the treatment of cancer. Non-small cell lung cancer (NCSLC) is the leading cause of cancer death. Genprex Inc. is advancing Oncoprex, shown to benefit lung cancer patients in early trials. A multiplicity of potential breakthrough treatments to fight cancer are in varying stages of clinical development, and many are focused on the promise of advanced gene therapies. Genprex Inc. (NASDAQ: GNPX) (GNPX Profile) is working to bring its potentially life-changing immunogene therapy, Oncoprex, to market. Pfizer Inc. (NYSE: PFE) just gained Food and Drug Administration (FDA) approval for TRAZIMERA(TM), and Tocagen Inc. (NASDAQ: TOCA) is studying Toca 511. Novartis AG (NYSE: NVS) scientists are exploring immunotherapy matchmaking. Other biotechnology companies such Audentes Therapeutics Inc. (NASDAQ: BOLD) are developing innovative gene therapy products for patients living with life-threatening rare diseases. 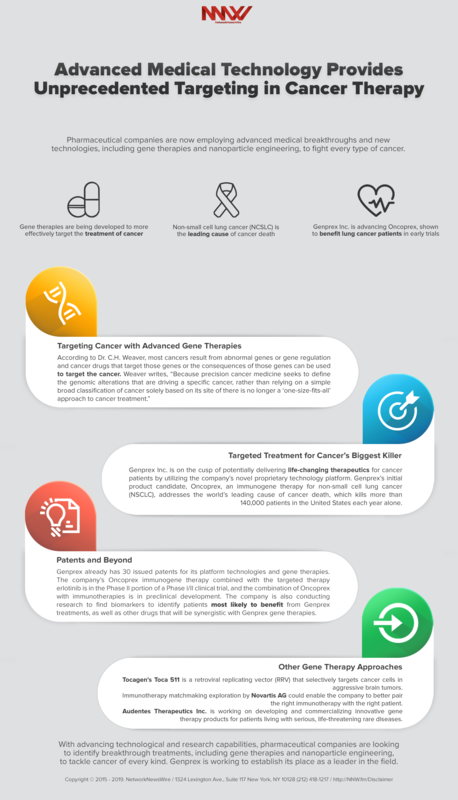 Genprex, Inc. is a clinical stage gene therapy company developing potentially life-changing technologies for cancer patients, based upon a unique proprietary technology platform, including Genprex’s initial product candidate, Oncoprex(TM) immunogene therapy for non-small cell lung cancer (NSCLC). Genprex’s platform technologies are designed to administer cancer fighting genes by encapsulating them into nanoscale hollow spheres called nanovesicles, which are then administered intravenously and taken up by tumor cells where they express proteins that are missing or found in low quantities. Oncoprex has a multimodal mechanism of action whereby it interrupts cell signaling pathways that cause replication and proliferation of cancer cells, re-establishes pathways for apoptosis, or programmed cell death, in cancer cells, and modulates the immune response against cancer cells. Oncoprex has also been shown to block mechanisms that create drug resistance. For more information, visit the company’s website at www.Genprex.com. NetworkNewsAudio, a service of NetworkNewsWire (NNW), allows you to sit back and listen to market updates, interviews and company press releases. NetworkNewsAudio keeps you informed on publicly traded companies we’re watching. The audio clips provide snapshots of position, opportunity and momentum. NetworkNewsAudio is a Brand Awareness Distribution Solution from NetworkNewsWire.